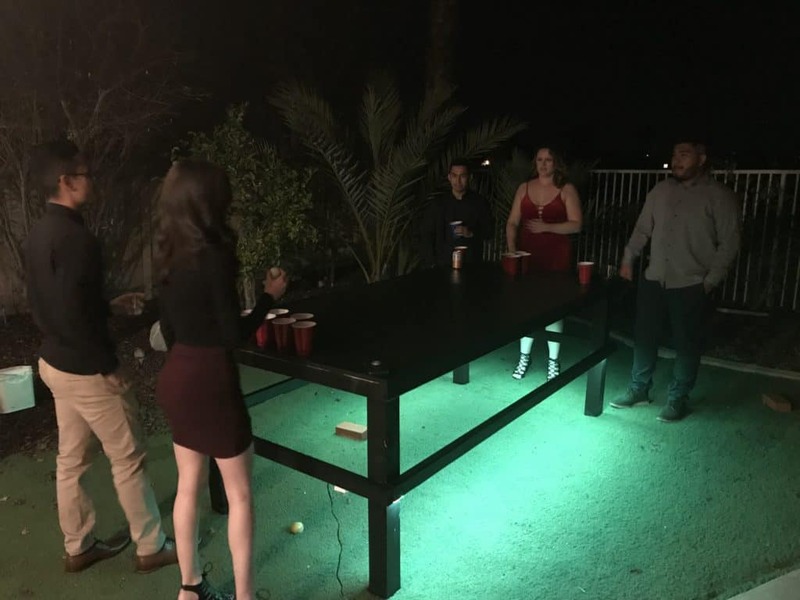 A Die or BeerPong table is the hallmark symbol of college socialization: an entertaining game platform whether you’re drinking, playing, or simply hanging out. 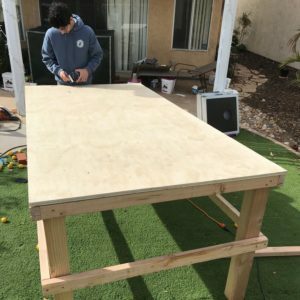 In this MyDorm blog, we walk you through step by step instructions to building your very own table. 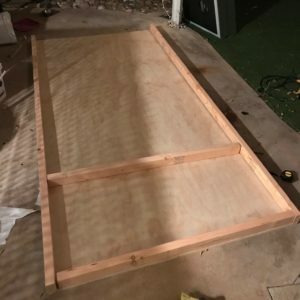 The total should place you under 200$ for all materials involved (screws, wood, paint). 1. The first step is to cut your wood according to the specifications listed in the instructions. Remember to use eye protection to protect from the sawdust. 2. 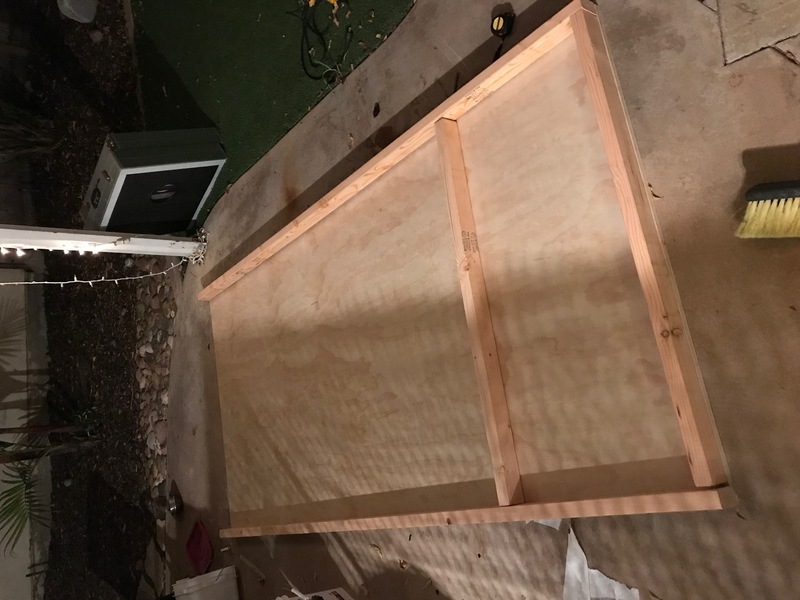 Lay down the foundation of the wood on the tabletop surface to ensure your cuts are accurate, and to lay out the structure to screw together. Drilling pilot holes will help the screws go through the posts. 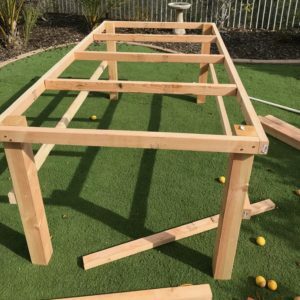 You should lay the full outline of the table with the three support beams prior to adding the screws. This will ensure proper fitment. 3. 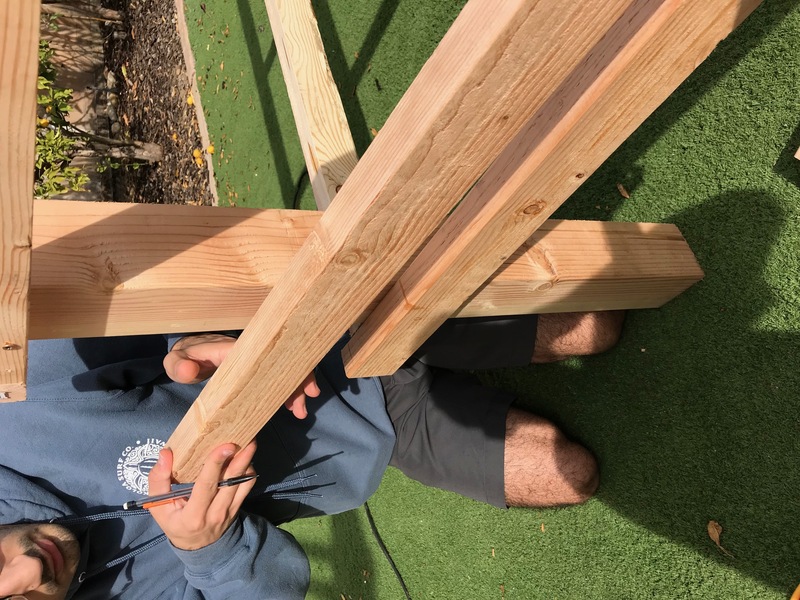 With your base in place, you can then place the leg posts in the four corners. 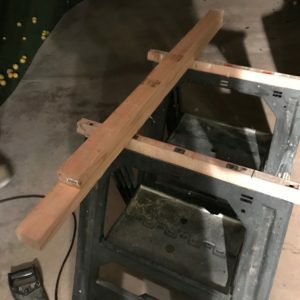 Align them flush to the corners, and drill in screws from both sides. 4. 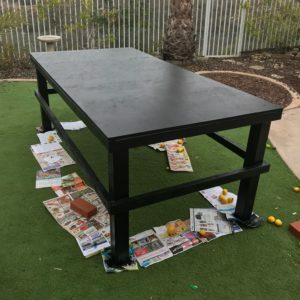 With the feet posts drilled in, you can now set the table upright to ensure the posts are straight. 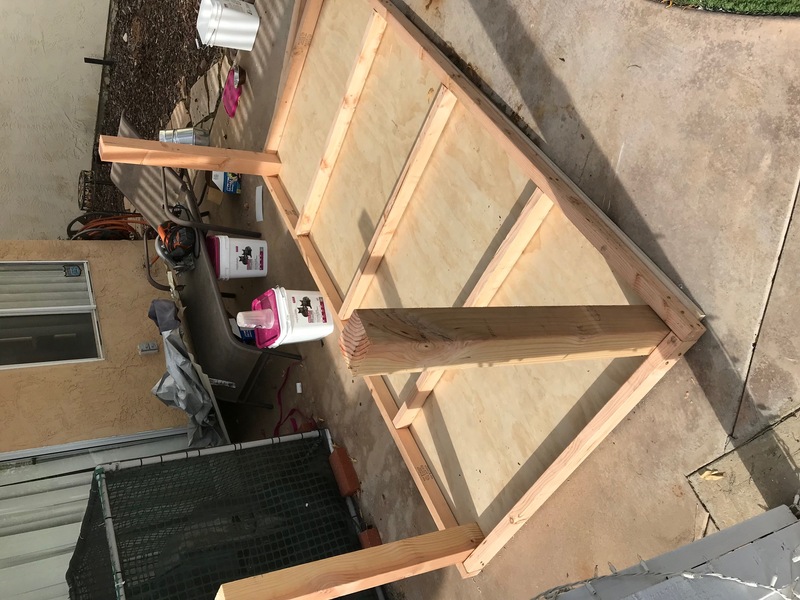 The next step is adding the support perimeter support beams. 5. 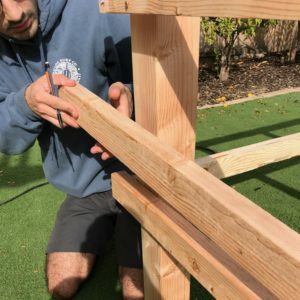 Align the support posts flush and screw them in to form a outline around the table. The height should be equal on all beams so that they rest parallel to each other. 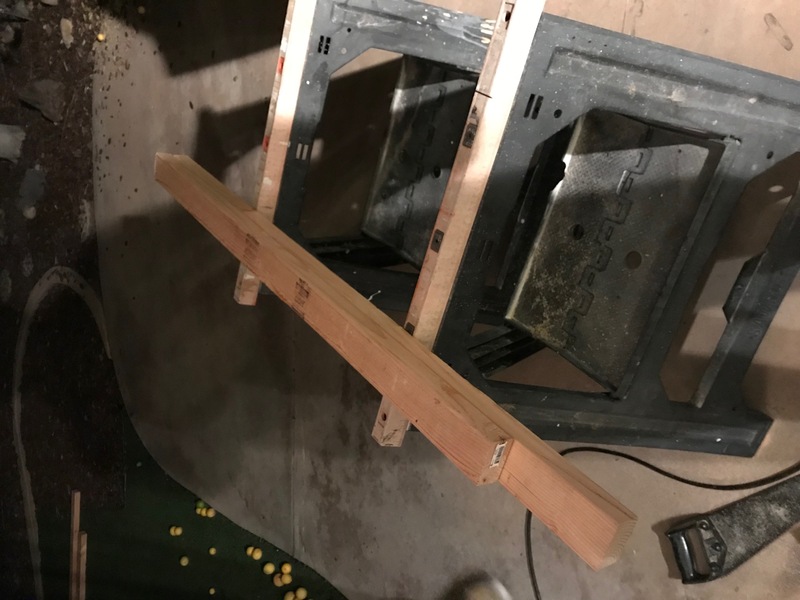 Depending on the placement of your leg posts, you may need to re-cut some of the supports to ensure they are flush. 6. 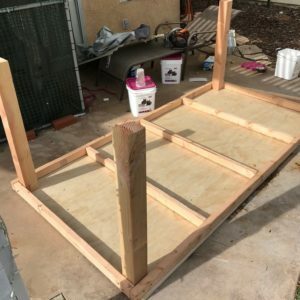 With the support in place, it’s time to screw down the top. 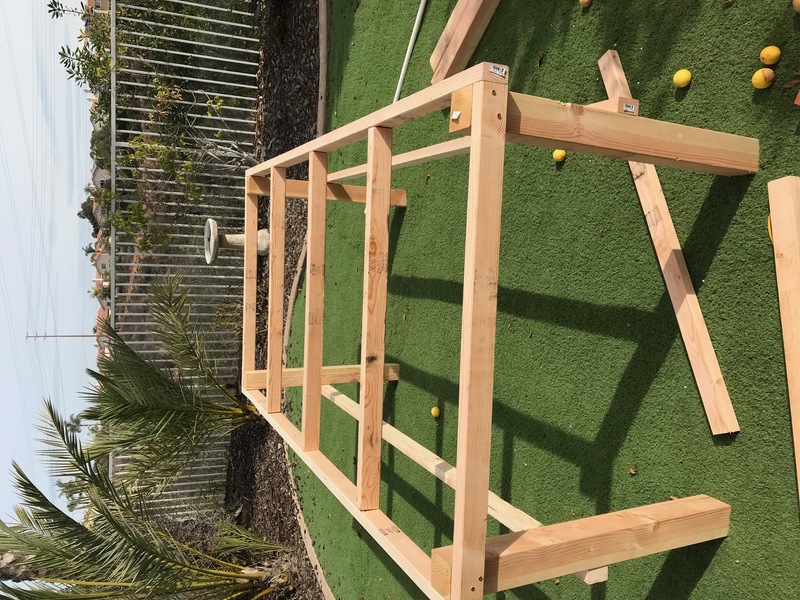 Focus on the four posts first, but put additional screws into where the supports are in the center of the frame. 7. With the top on, it’s time to paint. 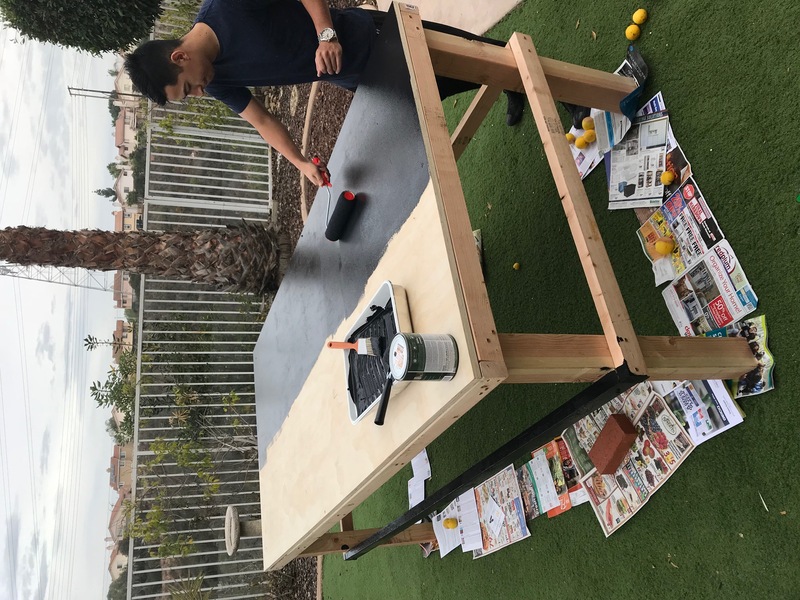 It’s useful to utilize a roller for the flat top surface, and to follow up with a brush for the corners and harder to reach spots. I advise painting all sides of the posts, as they will be visible. 8. 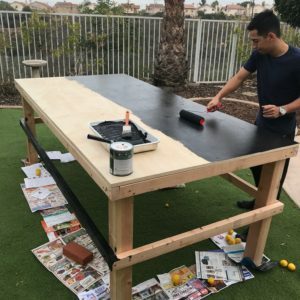 Allow the first coast of the outdoor paint to dry, and then apply a second layer. 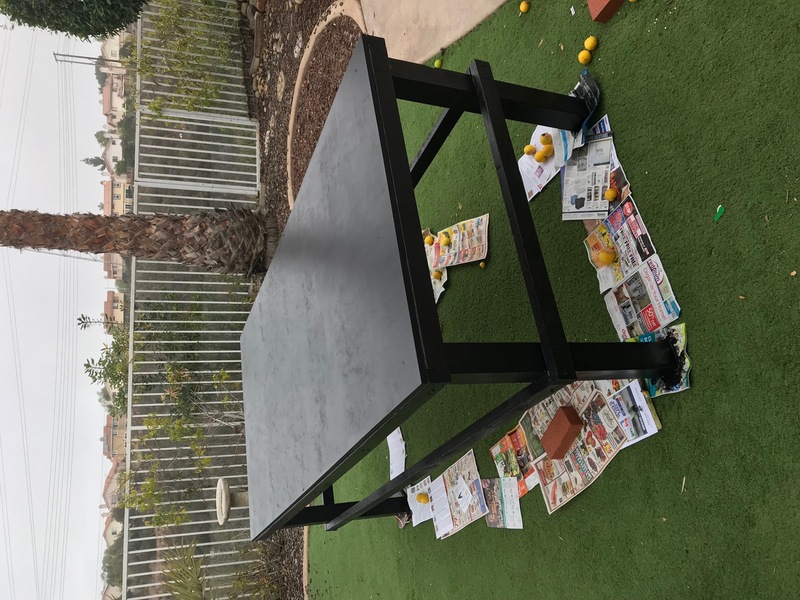 This will help the table withstand rain and spills. 9. 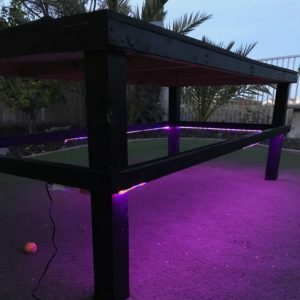 Finally, you can optionally add waterproof LED lighting. 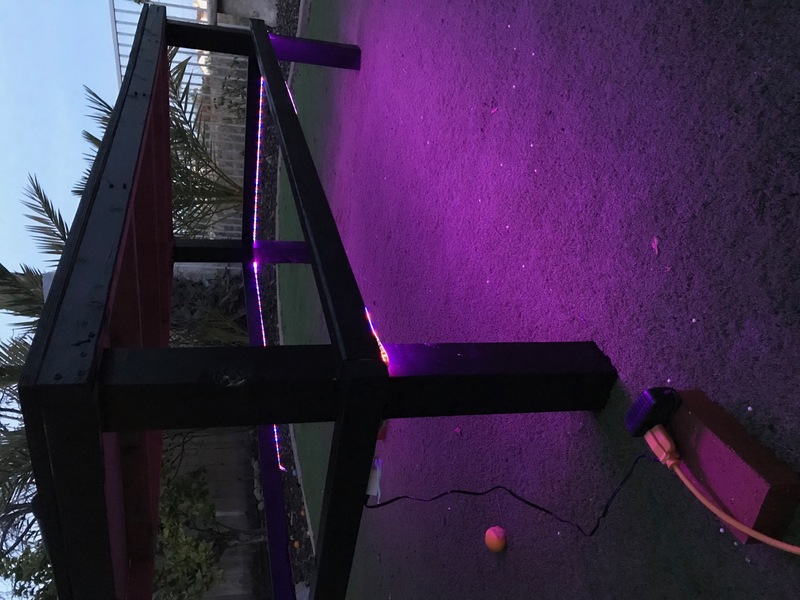 It includes sticky tape on the bottom side of the LED strip, so you can attach it to the supporting beams around the edge of the table legs. Congratulations! 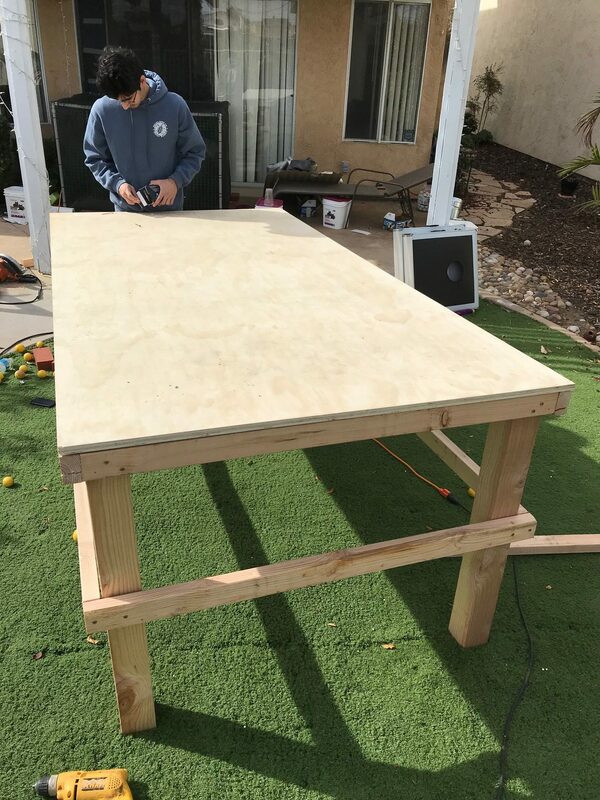 You’ve successfully built a budget die / bp table!